InAccel's Accelerated Machine Learning Suite (AML) is fully compatible with the Xilinx Alveo Accelerator card for Data Center Workloads. InAccel provide both the IP cores and the resource manager that allows the deployment of ML Accelerators both on-premise and on the cloud (AWS). 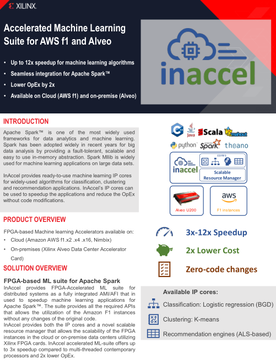 InAccel provides FPGA-Accelerated ML suite for distributed systems as a fully integrated AMI/AFI that in used to speedup machine learning applications for Apache Spark™. The suite provides all the required APIs that allows the utilization of the Amazon F1 instances without any changes of the original code. InAccel provides both the IP cores and a novel scalable resource manager that allows the scalability of the FPGA instances in the cloud or on-premise data centers utilizing Xilinx FPGA cards. InAccel accelerated ML-suite offers up to 3x speedup compared to multi-threaded contemporary processors and 2x lower OpEx. 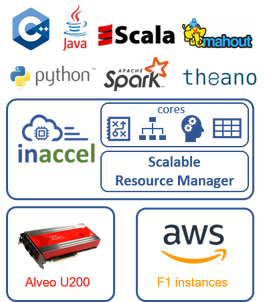 Download the Datasheet to learn more about the Alveo Solution.